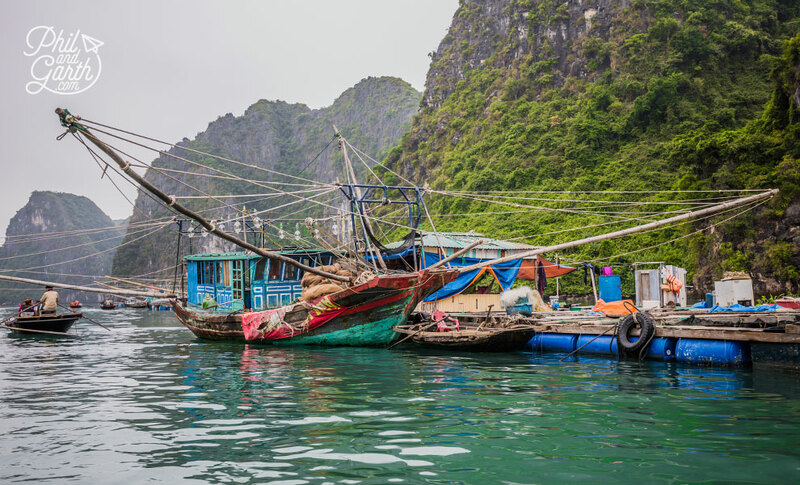 Must see sights, Things to do, Top 5 tips, Photography, Inspiration, Advice and information for planning a trip to Ha Long Bay, Vietnam. 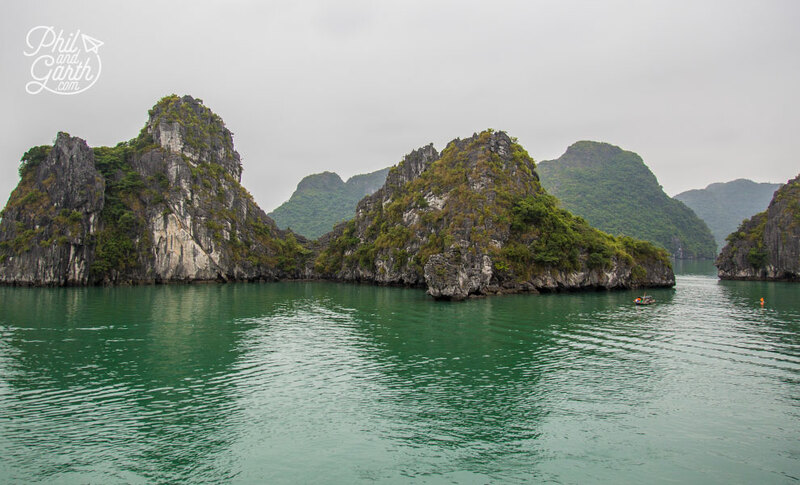 Ha Long Bay lies in the Gulf of Tonkin and is a Unesco World Heritage Site. 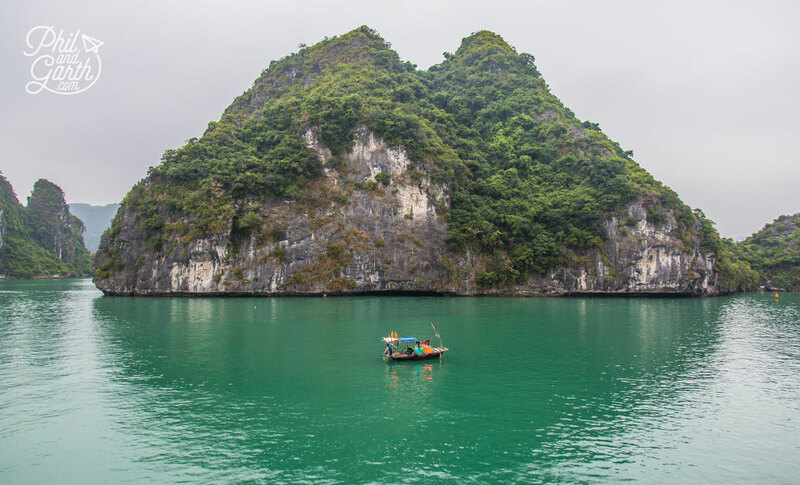 It’s arguably Asia’s most iconic natural beauty, a really beautiful unspoiled bay where over 2,000 spectacular limestone rocky islands dot the bay. 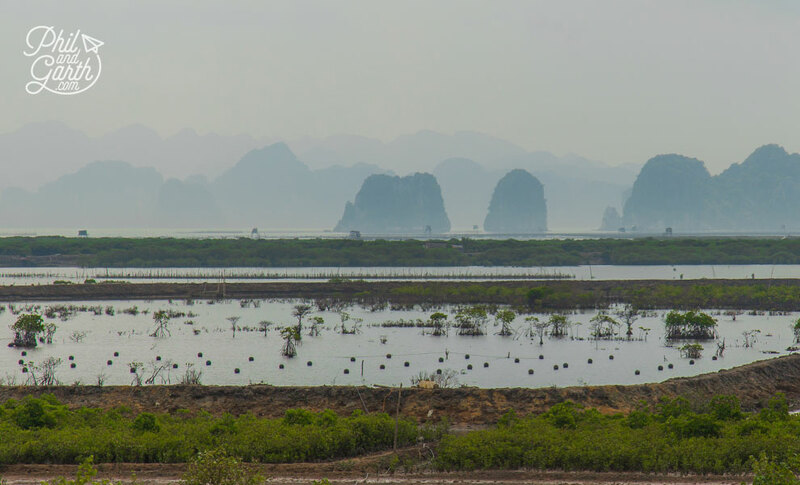 These islands are called ‘karsts’ and reminded us of the karsts we’ve been lucky enough to see in Phang Nga Bay in Thailand and Yangshou in China. 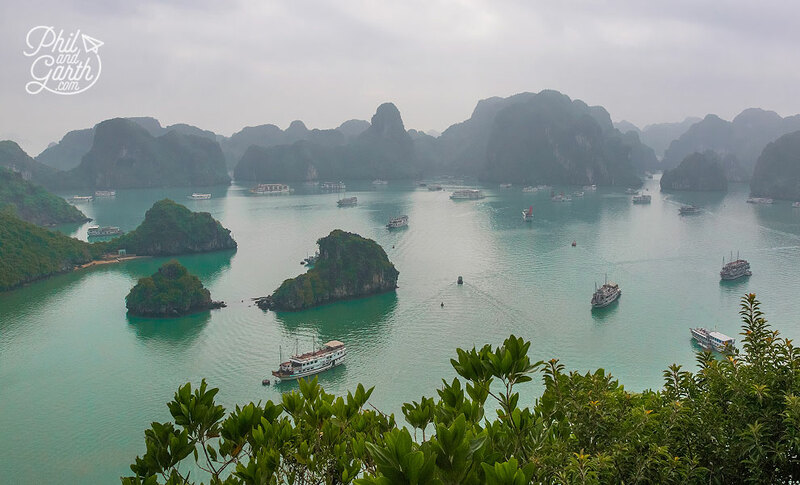 Those places looked similar, but Ha Long Bay trumped them due to the sheer number of islands rising out of the sea. 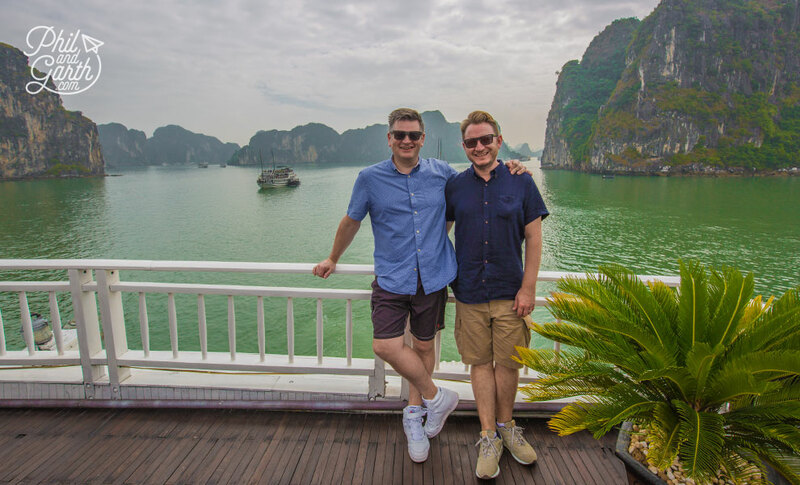 The Vietnamese call it the ‘8th Wonder of The World’ which we thought was funny because of the other destinations we’ve been to who also call their attraction the same! We read and were told of the local legend – 2 of them! One legend says a family of Dragons were sent to help the people of Vietnam during a Chinese land invasion, the dragons spat out pearls, jade and jewels into the bay which turned into clusters of mountains, creating a fortress to protect the local people. The other legend says said dragons crash landed in the bay creating the karsts. 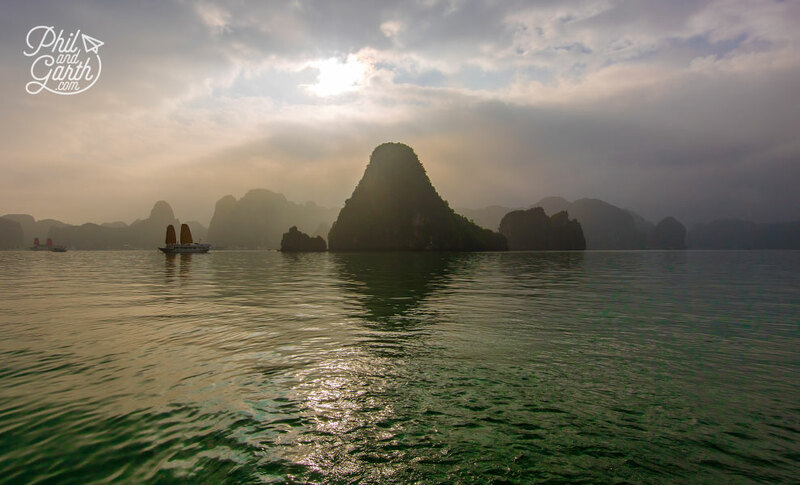 Whichever is true, Ha Long means ‘Descending Dragon’. To get there we drove east from Hanoi which took us about 4 hours, it’s only 115 miles but the roads are not exactly fast motorways. 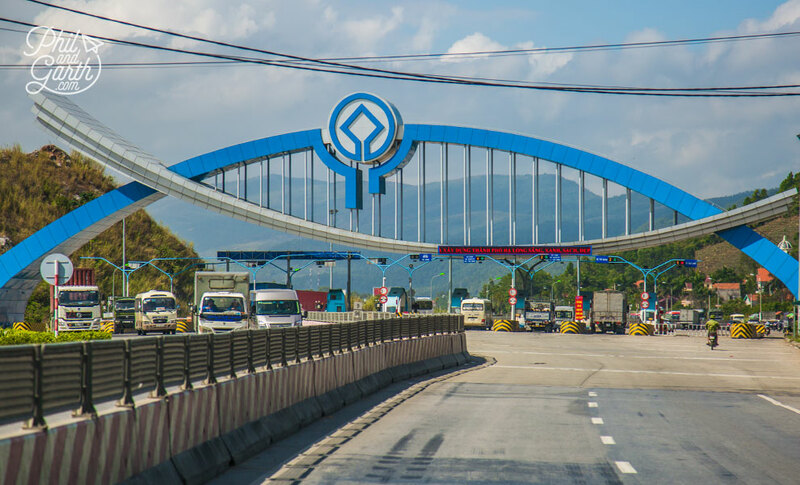 After entering the toll booth style entrance we arrived at the Tuan Chau New Marina where we boarded our boat for the next 2 days. 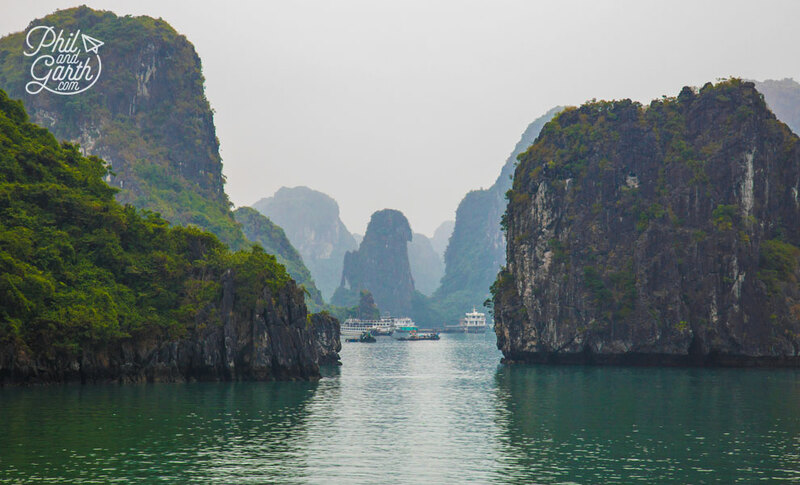 Ha Long Bay is not far from the Chinese border. We took the Jasmine junk boat which was just lovely. 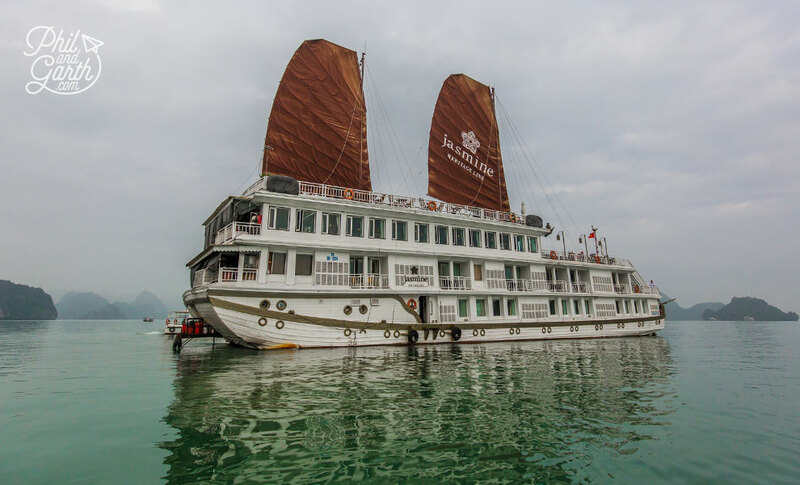 It’s the largest wooden boat in the bay, enough for 35 passengers, built in the style of a traditional junk, that were used to transport goods. 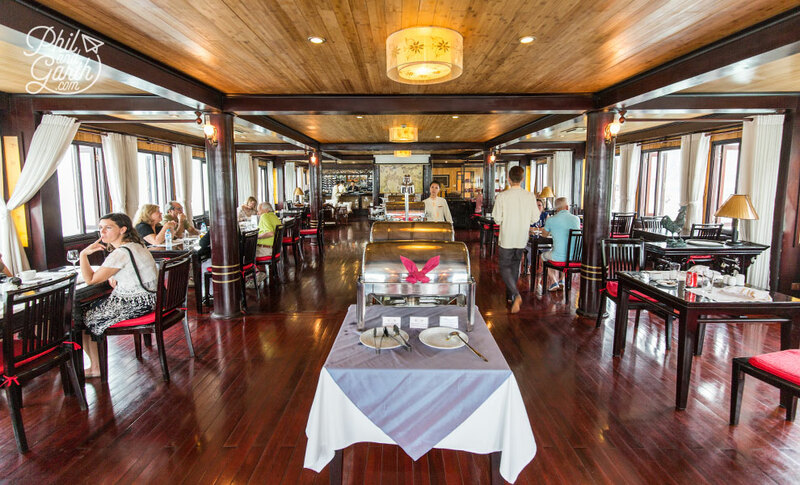 Inside was beautifully decorated with teak furniture and highly polished wood cladding, we felt like we were on board the Orient Express on sea. After a welcome drink, and an in depth safety briefing, the cruise began and we were let loose! We immediately headed to the upper deck – what a view! It was just stunning floating through the silent and dark emerald green waters and marvelling at the soaring cliff peaks, varying in size some of them super tall, Garth said it was like looking at movie scene straight from Avatar! 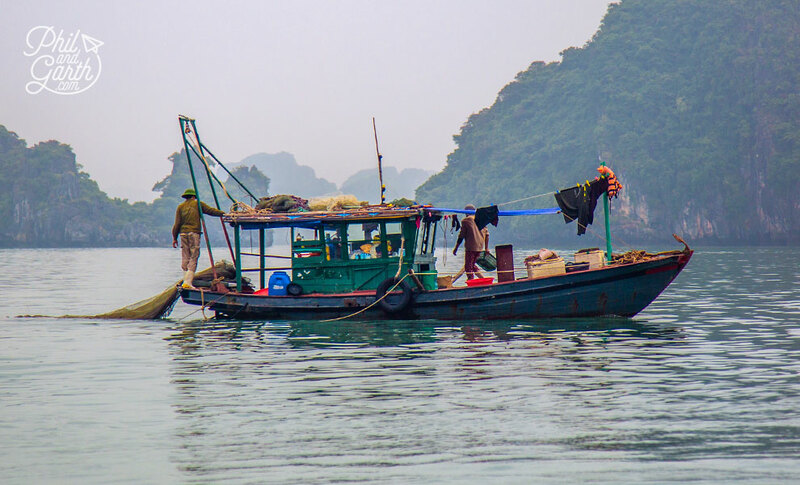 After the madness of Hanoi, it was wonderful contrast – Phil loved the pure relaxation of sailing on the tranquil waters. 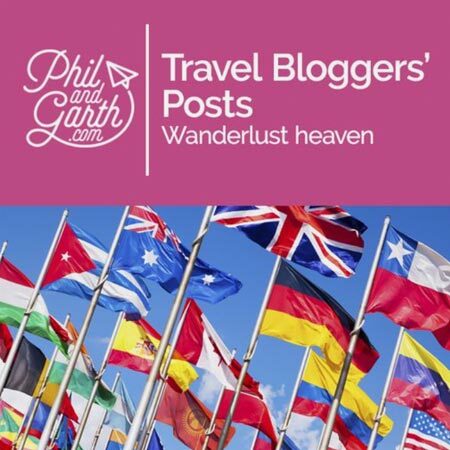 Garth loved all the photo opportunities and soon filled up one of his cards with shots of different karsts carpeted with thick jungle like vegetation. 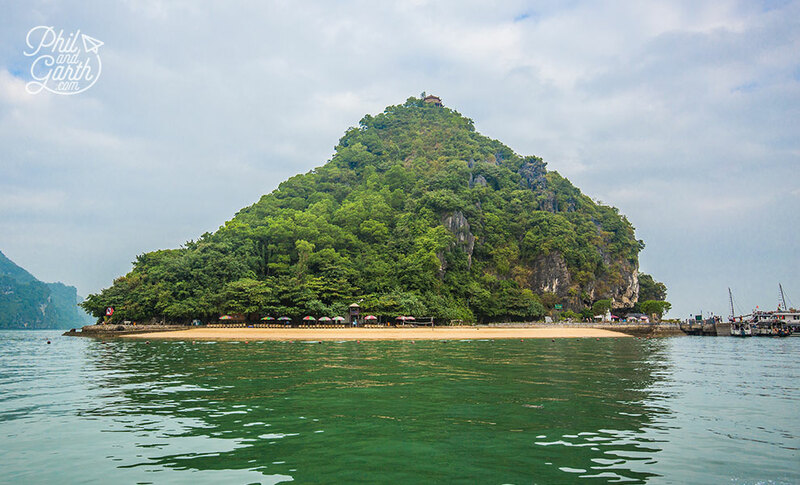 If you don’t fancy a cruise a growing number of tourists are now heading straight to Cat Ba Island where they take trips to Lan Ha Bay. We had a private 2 berth cabin with an en-suite and views to die for. 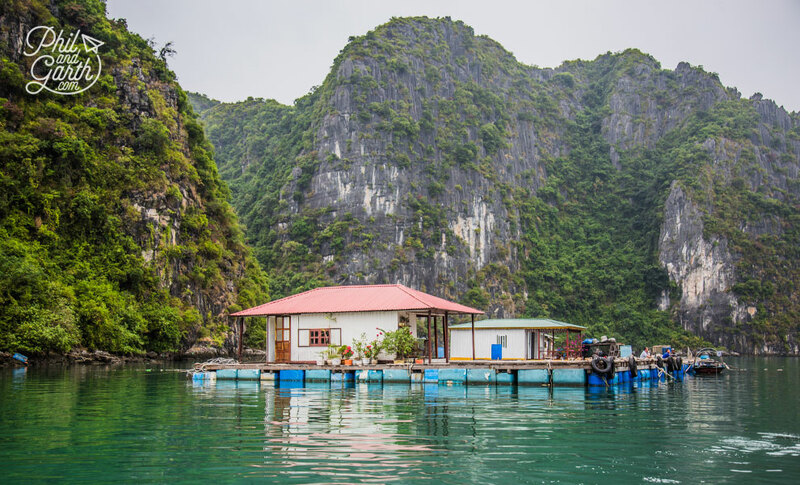 We would definitely recommend spending at least one night, rather than taking a day cruise as most tourists do because it gave us enough time to relax. They even had spa treatments on board if you really want to chill out. Food on board was served buffet style and was tasty, especially the Pho for breakfast that was cooked in front of you. Phil also took part in a cookery demonstration by the head chef explaining the process of making spring rolls, finished off with eating them. 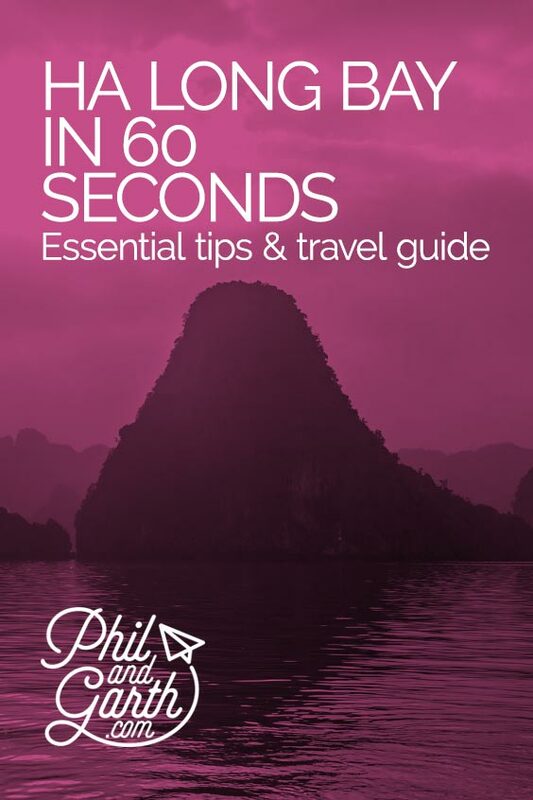 Phil is a Vietnamese millionaire! We also realised on the boat that we were millionaires! 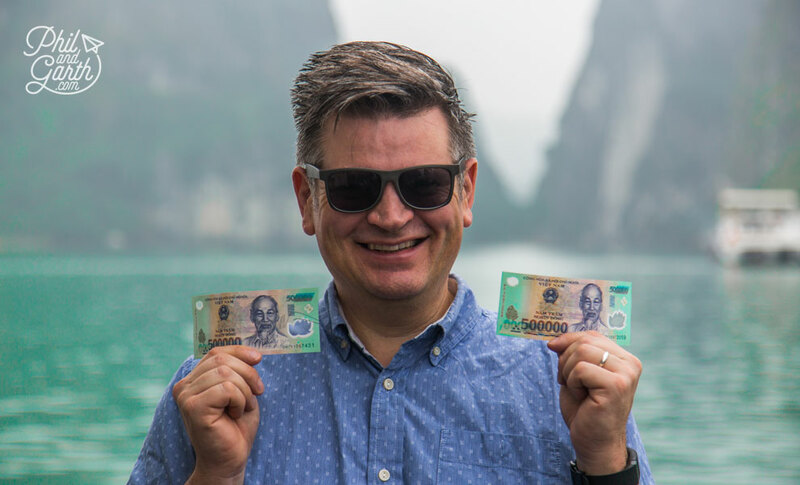 well we had a few notes – 1,000,000 Dong is actually about £40. Sadly the weather was cloudy, but it was warm and didn’t spoil our enjoyment of the bay. We’d also brought lots of mosquito spray but did’t need it. Relaxing is the name of the game here, especially on the upper sundeck taking in the fabulous views. Our boat anchored for the night in the Luon Bo area where we spent the evening socialising with our fellow guests enjoying far too many glasses of Hanoi Beer. Phil taking the tai chi class. We woke up early to witness the sunrise, but sadly just a few pink spots in the sky as it was still really cloudy. 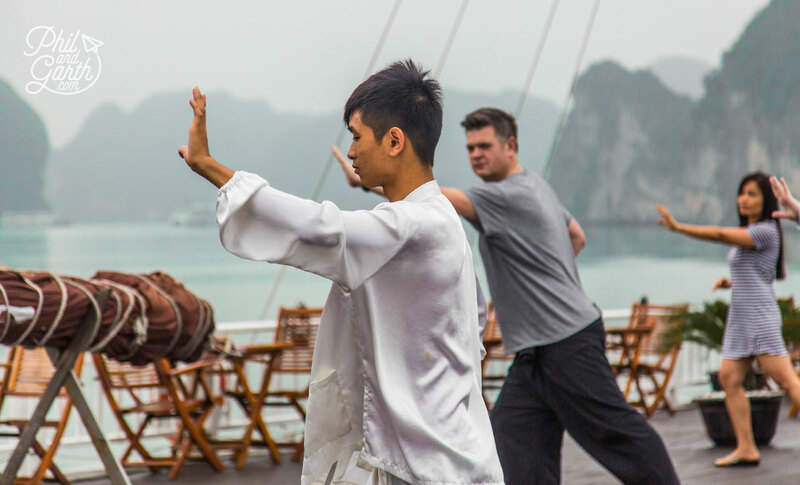 Phil took advantage of the Tai Chi class on the sundeck at 7.00am, which was so magical but pretty exhausting, after about 20 minutes Phil was aching, the tutor then said, now the warm up is finished we will start the Tai Chi! Our first excursion was to Ti Top Island, which was easily the best photo spot in the bay. At the bottom it had a small man made beach, a couple of restaurant shacks and Garth’s favourite – tourist tat souvenir shops! The bay was pretty crowded with boats, but apparently this part always is. The views from the top of Ti Top are epic and well worth the hike getting there. But it was more like a workout especially for us as we’re not fit (there’s a theme running through this post!) There were 400 steep steps with a large viewing platform half way up where we could rest, it eventually took us about 20 minutes. Even on the cloudy day we had, the panoramic views were very atmospheric, it must be even more spectacular on a clear day at sunset. Back on the beach Phil took a refreshing paddle in the water, but decided it was too cold to swim. 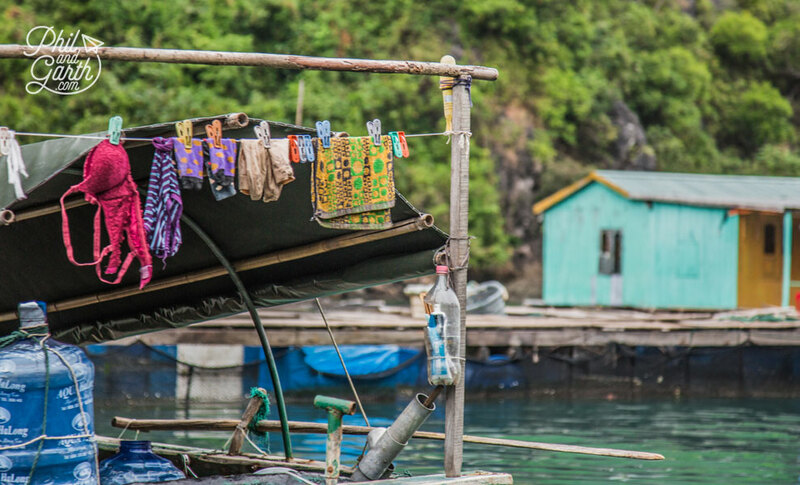 Cua Van was an extraordinary village where about 700 people live simple lives on the water, it’s also the biggest of the 4 floating villages in Ha Long Bay. 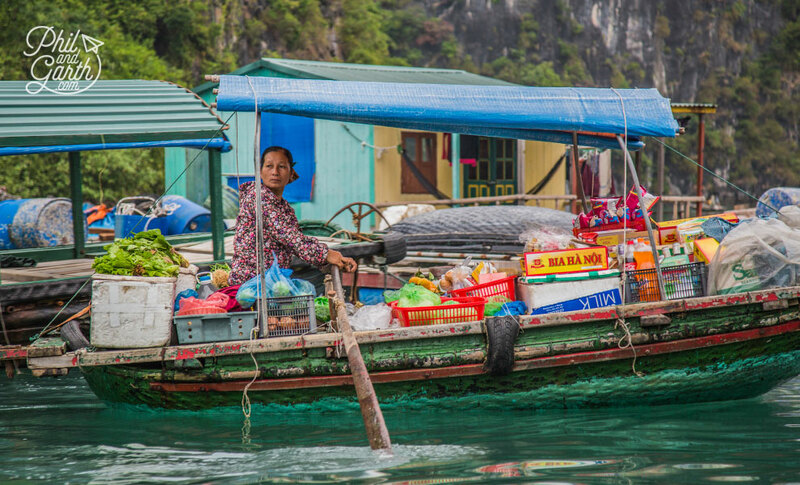 We took a sampan – a small bamboo boat and drifted past various homes, a school and a temple that make up the village. Families and children live on rickety looking platforms, but they didn’t seem bothered as they waved to us.. 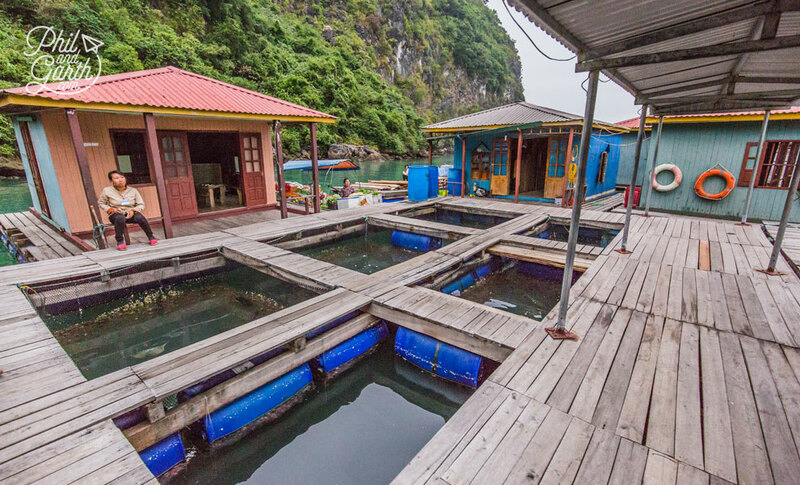 These people used to live in caves, but when the bay became a Unesco site, these floating homes were provided for them to live on water instead. No need for a washing machine living on water? 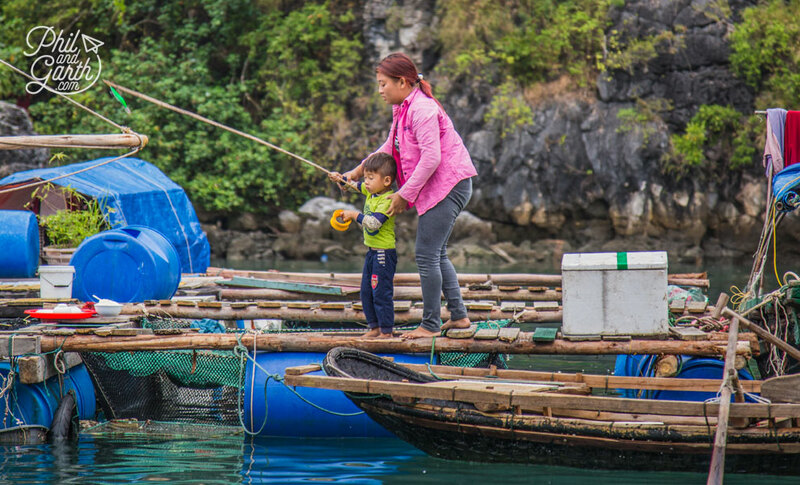 Today families earn a living by selling the fish they catch to boats and hotels back at the harbour or rowing tourists in their sampan boats for sightseeing. Fishing is done at night when they drop these giant nets into the water and turn on lights above the net to attract the fish, once the fish are over the nets, they are pulled up catching the fish. You can’t escape those hawker ladies! We were given the option to explore the village by sampan boat or kayak we chose the boat as Garth wanted to take photos, and also the last time we went kayaking in the Maldives resulted in loads of arguments, so best not! The kayaks must be good for experiencing the karsts close up from a different perspective. 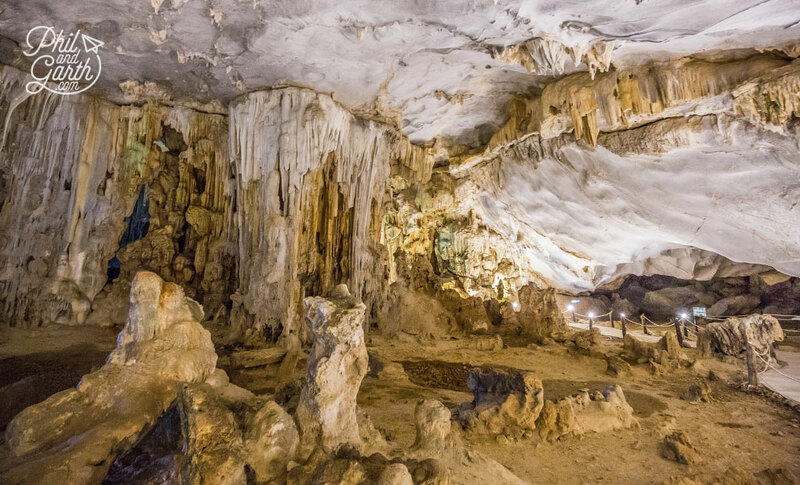 At Cai Tai island was this cave – Tien Ong, which was owned by the operator of our boat. Split into two chambers they are still being excavated by archeologists after they found human remains dating back to 10,000 BC. Our guide took great delight in describing shapes in the staglities and rock formations that resembled things like frogs or faces. 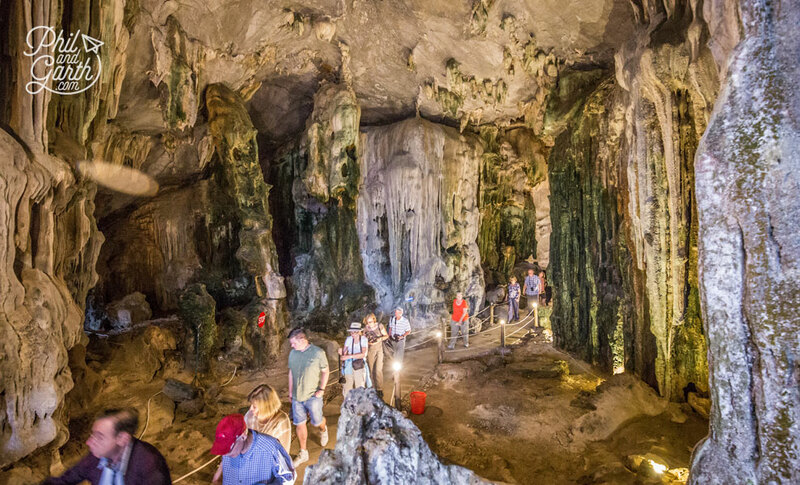 There are hundreds of caves in Ha Long Bay, so make sure you stop and explore one of them. The amount is hardly surprising when you think the karsts took 20 million years to form! After a couple of days on the boat we left the bay and passed fields of shrimp and pearl farms. 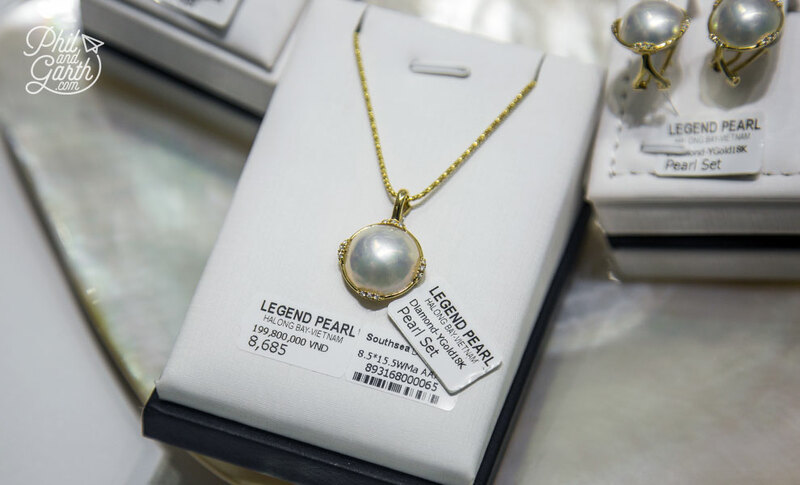 We stopped off at one of the few pearl farms called Legend Pearl. 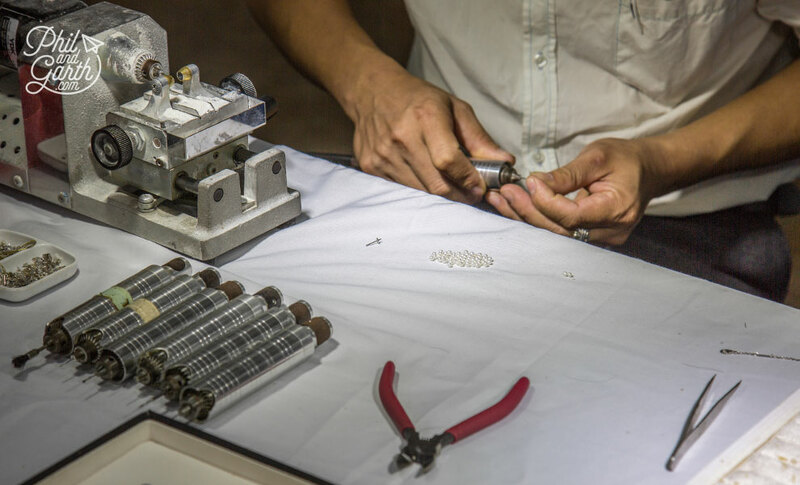 It’s packed full of tourist buses but don’t let that put you off, as it was a fascinating education to see how jewellery is made and how pearls are cultivated. 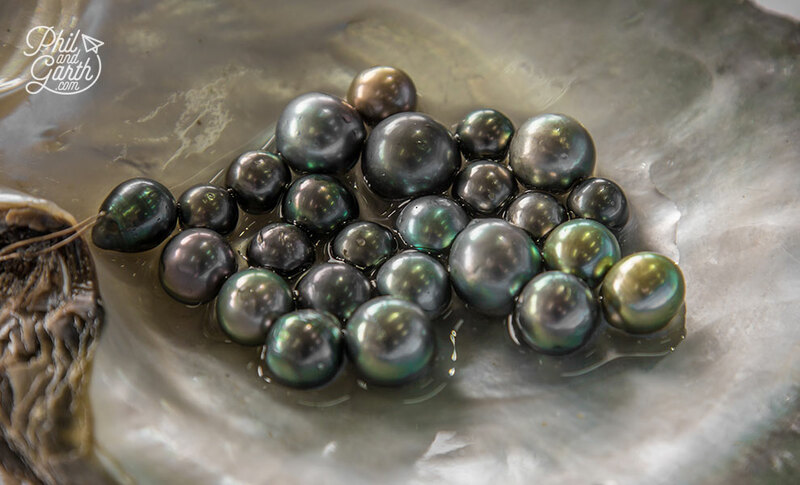 Pearls from Ha Long Bay have a distinct black and green appearance. 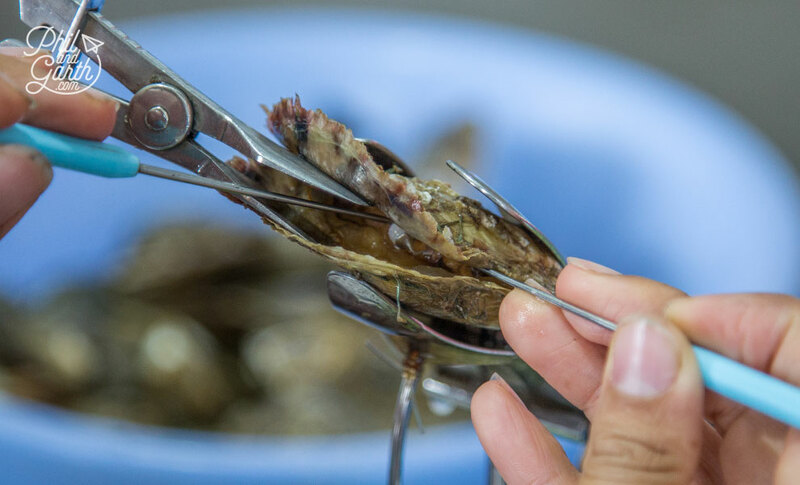 The process starts with workers performing surgery on oysters, transplanting them with a small coral bead. 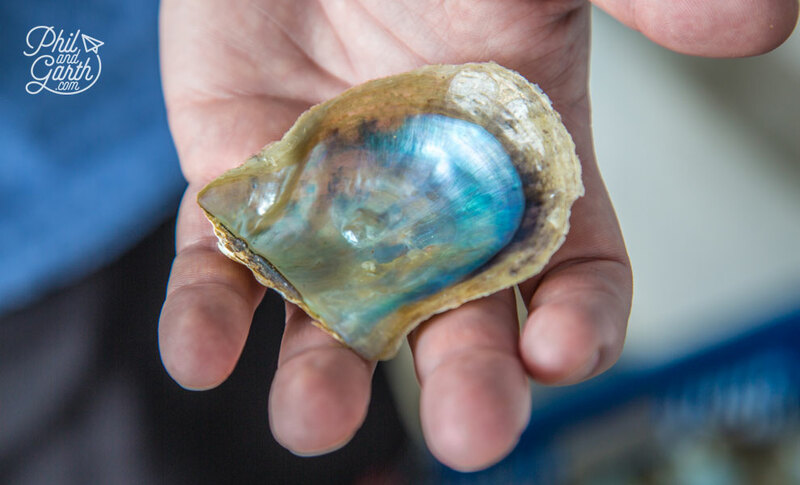 This becomes a nucleus for the oyster to deposit iridescent layers of ‘nacre’ to form the pearl. Ouch, poor things! We preferred the look of the shells more than the pearls. Finally exit through the gift shop, of course, well in this case as massive shopping mall sized showroom with plenty of wealthy Chinese tourists snapping up items. The funniest part were the pictures in the showroom of A-List celebrities wearing pearls from Hilary Clinton to Esther Rantzen, um, random! 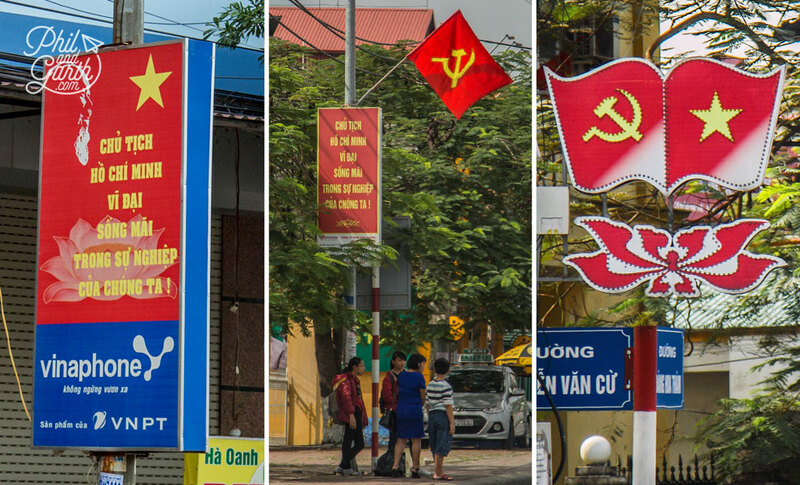 The Communist Party in Vietnam use the hammer and sickle as their party symbol, and you’ll see plenty of these symbols in different forms on your journey to and from Ha Long Bay. 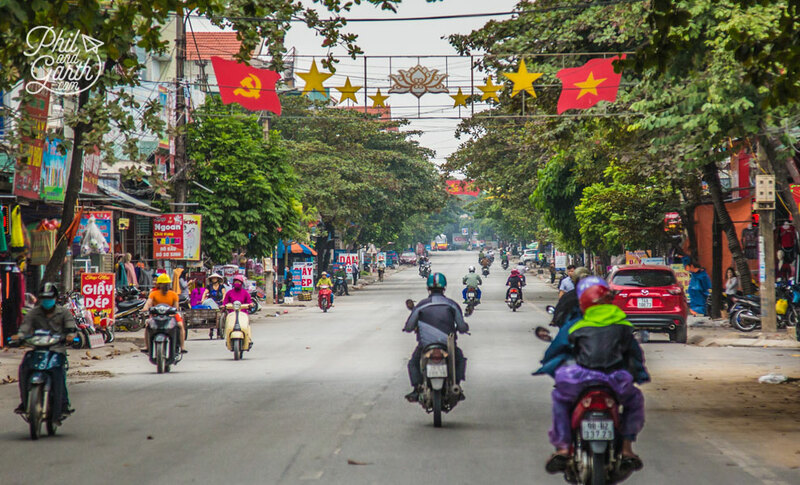 The hammer and sickle is usually shown side by side Vietnam’s national flag. You can’t not fail to notice the dozens of socialist propaganda messages everywhere, we found them fascinating, no idea what they said but we kept trying to work out what they might say. 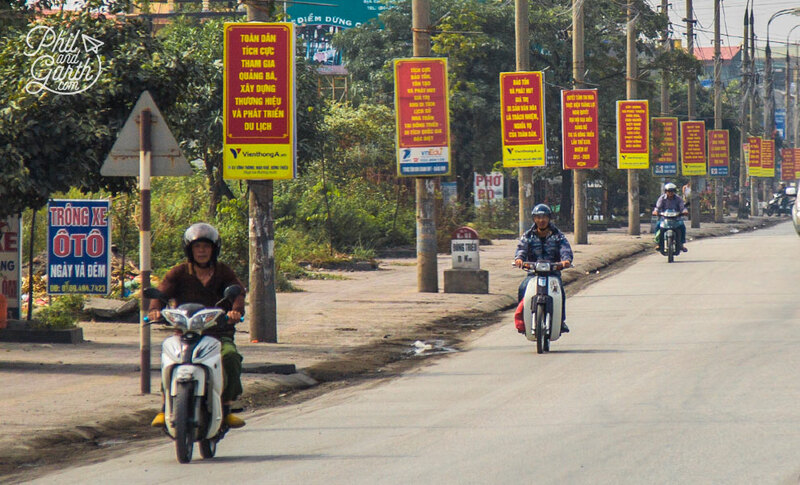 They vary from multiple signs that line lamp posts to gigantic billboard sized ones as we entered a new town. Garth being a graphic designer was fascinated by them, they have distinctive yellow text on red backgrounds. 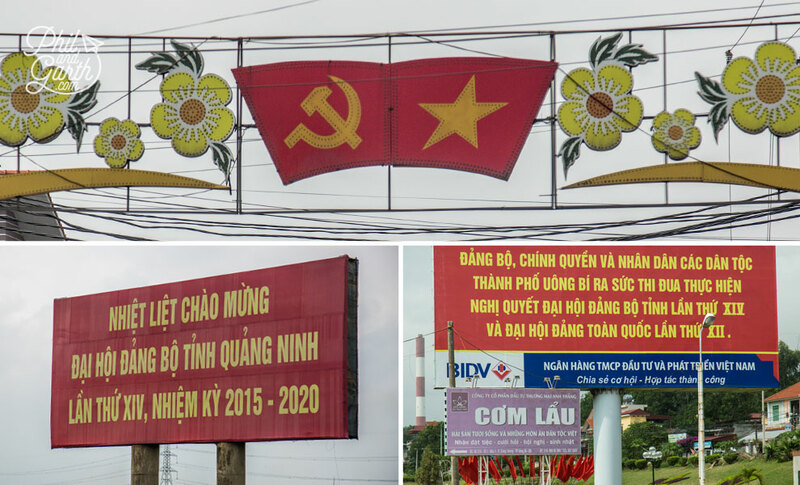 A quick Google translate and these signs say “Warmly celebrate Party Congress Tinh Quang Ninh term XIV 2015 – 2020” and “Dang Bo, government and people of all nationalities Uong Bi Town striven to implement Resolution Party Congress and XIVth Provincial Party Congress XIIth National” ok, so there’s probably something lost in translation there! Our guide told us since 1997 and access to the internet the population understand more now and know what’s going on. 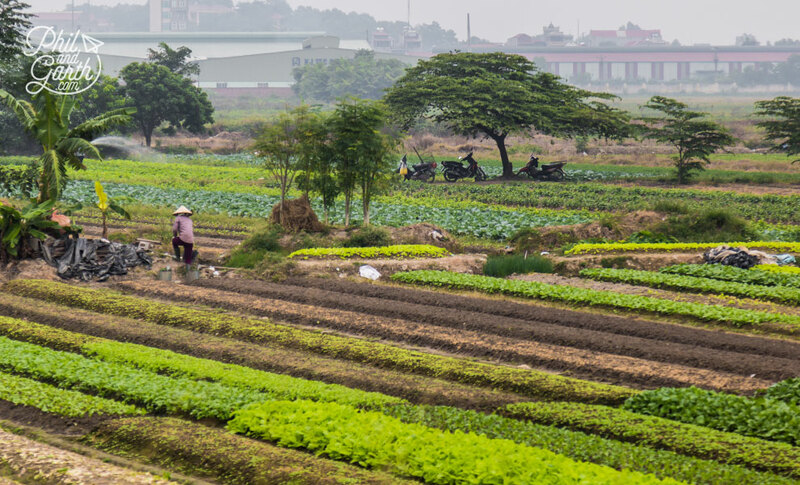 One thing that was clear to us is just how hard the Vietnamese work. Passing through the urban farmlands we noticed they didn’t have any machinery. 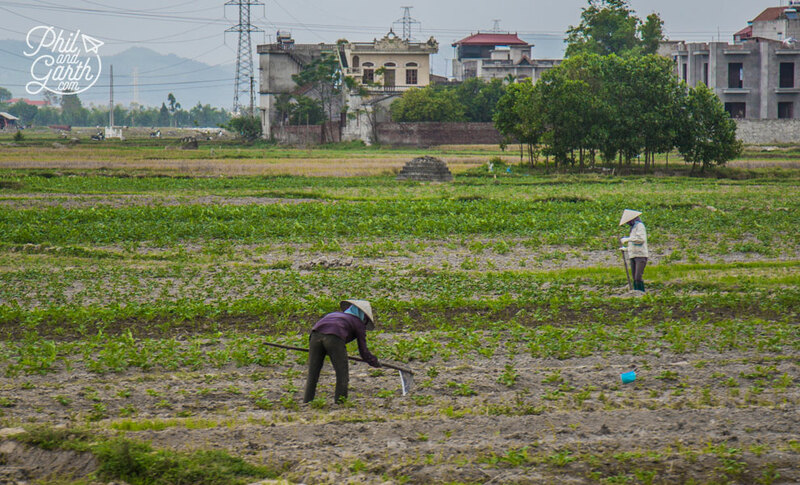 It’s all manual labour done by hand with the odd water buffalo for helping ploughing their fields, it must be a very hard life. 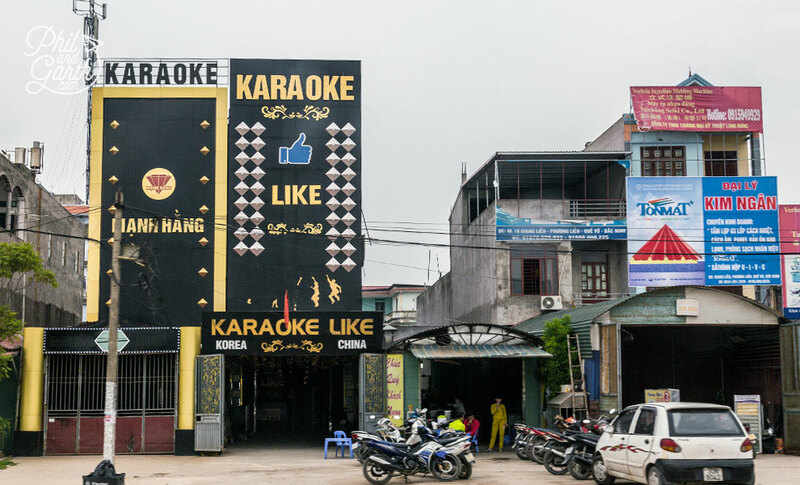 Karaoke bars are massively popular with the Vietnamese in their spare time, especially with men who drink a lot! 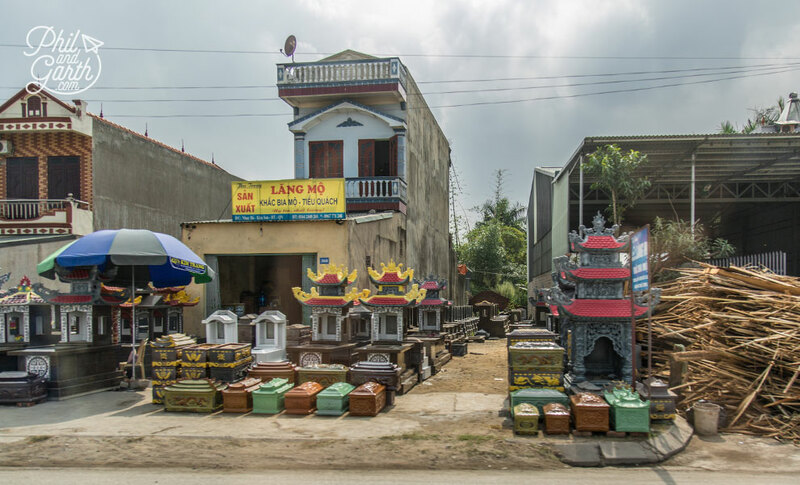 Phil loved looking out the window passing the potpourri of shops selling everything you can think of – phones, ornate furniture, marble statues even coffins. We also passed mega sized electronic factories including Canon and Samsung. This is where all our Canon products really come from, including the cameras that we use. 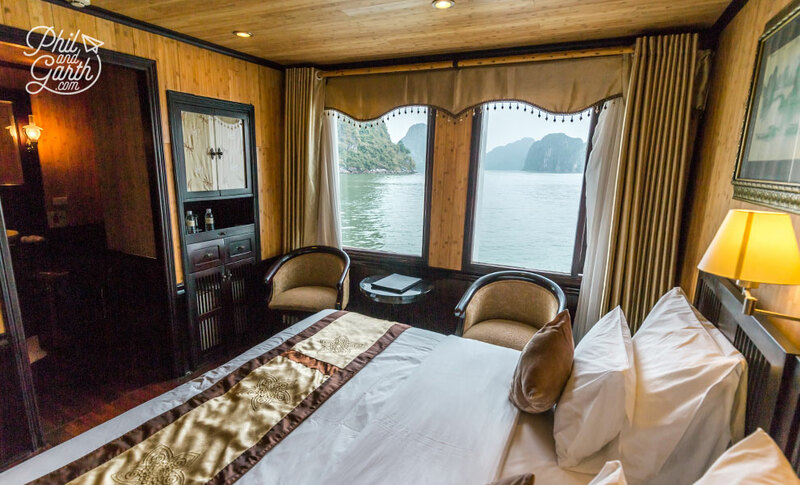 Ha Long Bay was an enchanting place and a life experience we will treasure. 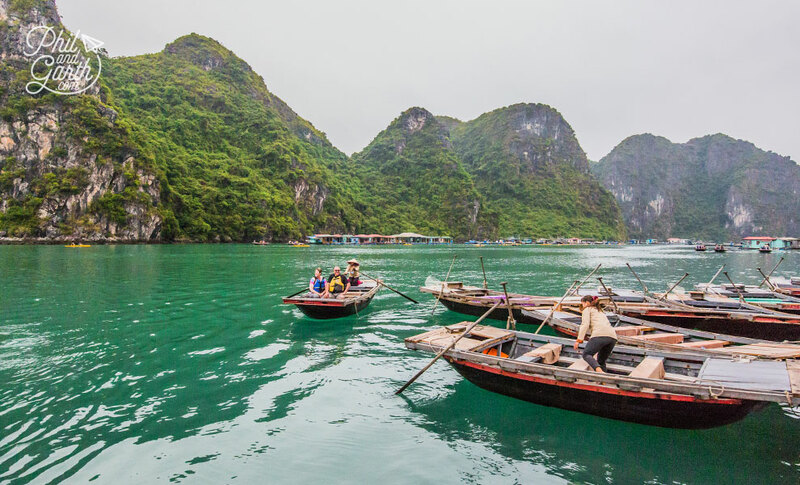 It’s a must see sight of the world if you are visiting Vietnam, especially if you stopping at nearby Hanoi. Tip #1: Don’t go for the ultra-cheap boat options, make safety your priority when staying on water. Tip #2: Beware of strong currents close to the bottom of karsts if you are kayaking or swimming. Tip #3: May to September is low season, prices are much cheaper. But expect storms and hurricanes in July and Aug. Tip #4: Things may look nice and clean but still use a hand sanitiser regularly to avoid being ill. Tip #5: Wear trainers, not flip flops if you’re doing the hike to the top of Ti Top Island. 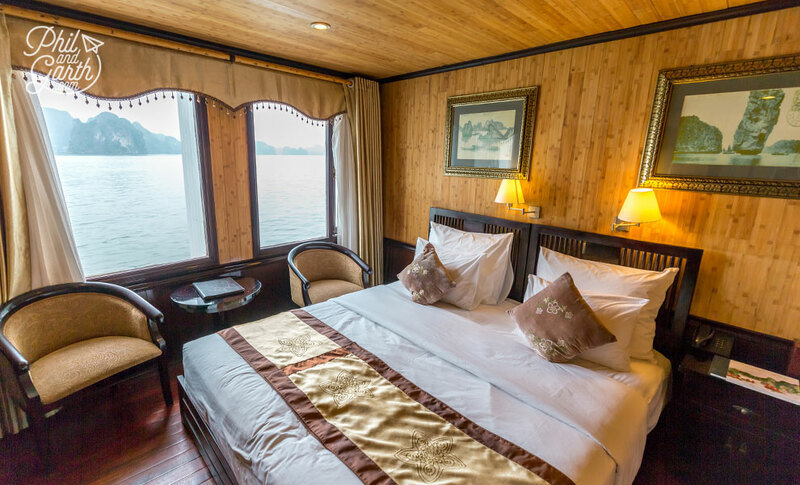 The overnight cruise looks so cool and waking up to those scenic views will be great. I loved all your pictures. Beautifully captured. Vietnam was on my list but reading your post it’s for sure know. That overnight cruise sounds good, great way to relax and enjoy the stunning scenery. … that cave would be nice to explore. What amazing photos! 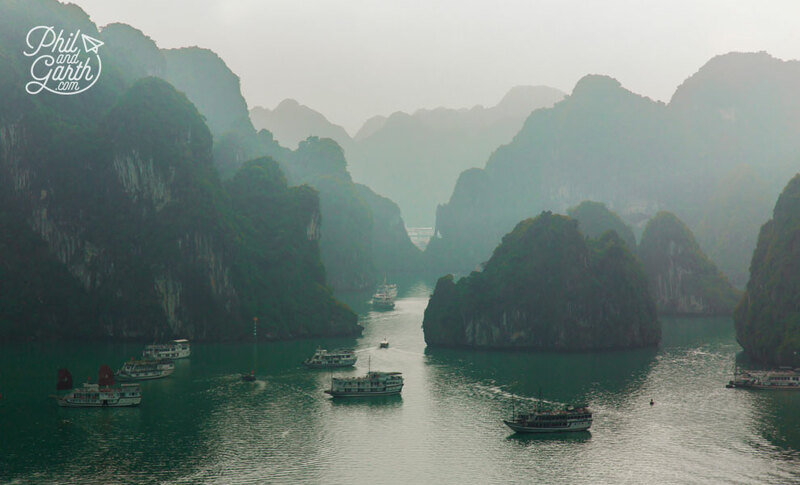 I have never heard of Ha Long Bay, but now I want to go. I think I prefer the story about the islands being formed by gems than the other one. And the photo of you being “millionaires” is really funny! 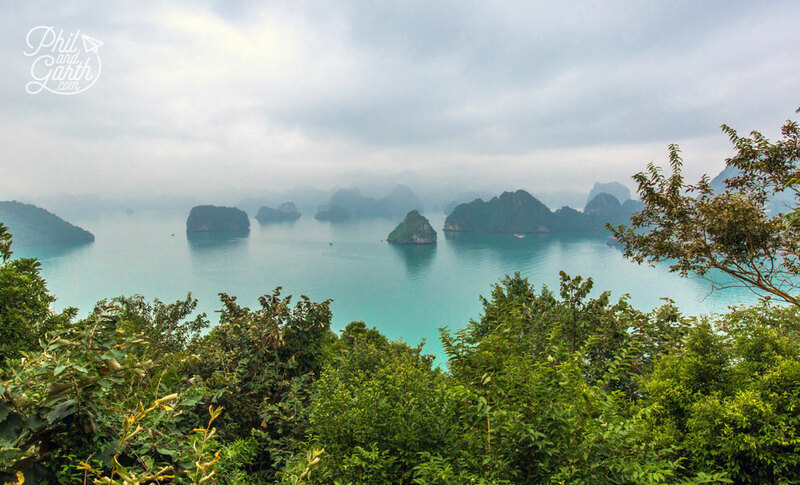 I lovee halong bay! I visited last summer, and it’s beautiful! A shame about the rubbish in the water though…. A real shame. I would’ve loved to try morning Tai Chi! 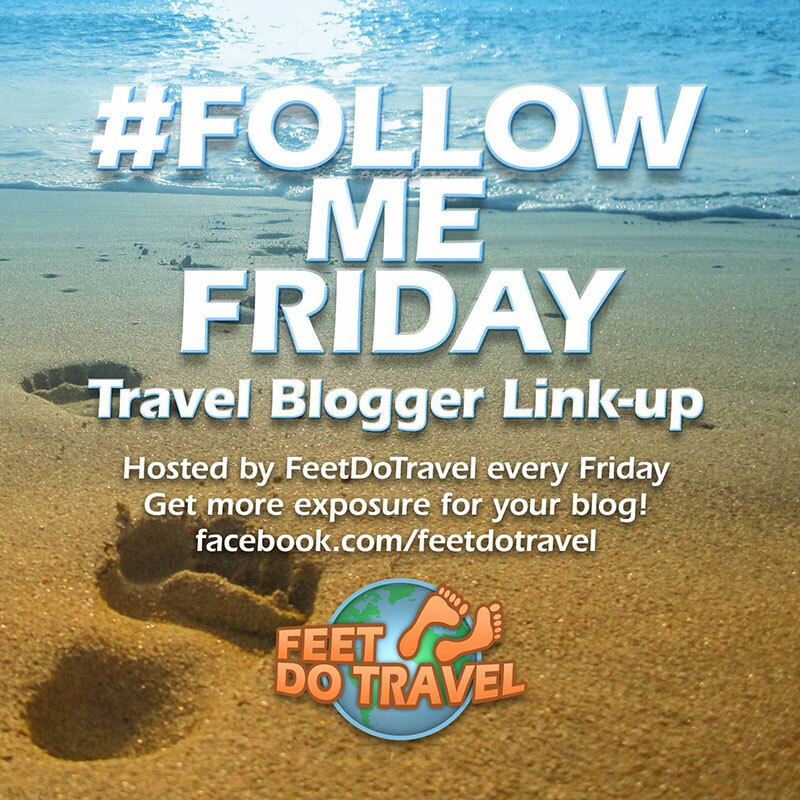 Finally i see a blog amazing organized , i loved the pictures and the fun in your writing. I liked especially the pearls pictures and explanation since i’ve never read about it before. I love your posts, especially the 60 sec videos to get us hooked. 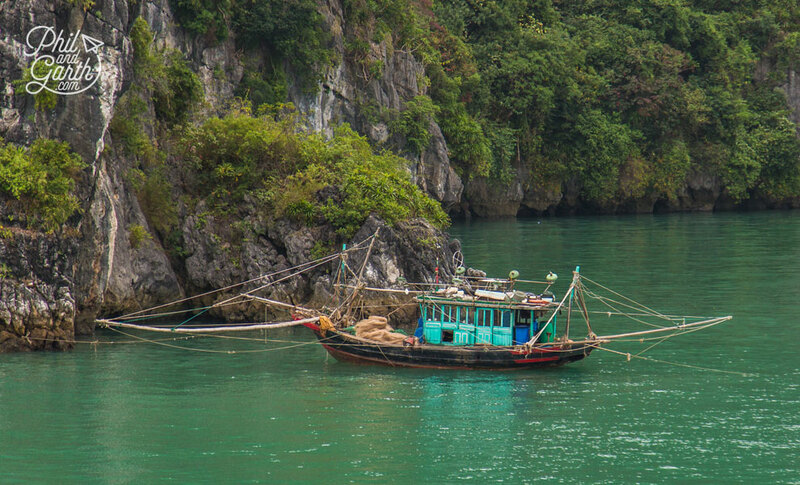 I can’t wait to get to Ha Long Bay, we didn’t have time from Hanoi on our last trip. Thanks for the boat recommendation too, there are so many to choose from! Cheers! I miss vietnam so much. 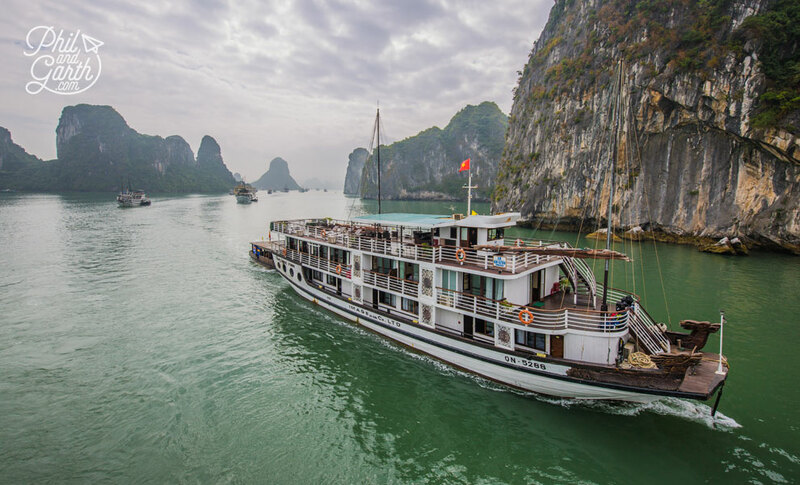 This reminds me of our cruise tour on Ha Long Bay too! I wish water was cleaner though for some fun jumps from the deck! 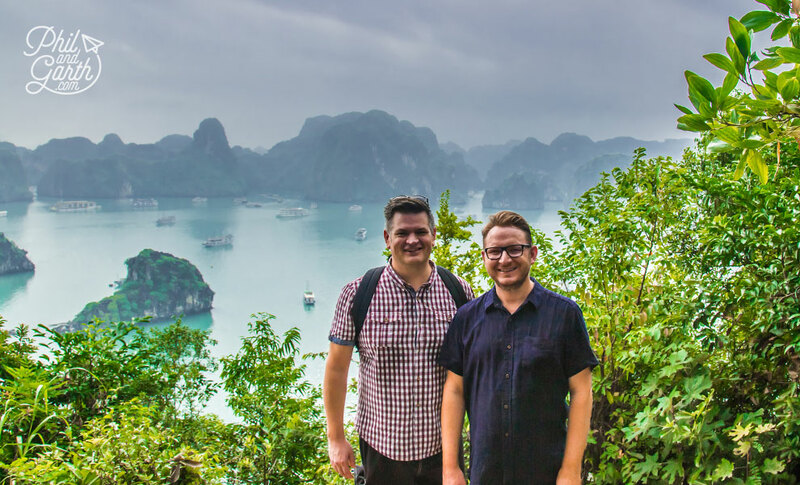 I am so jealous I haven’t visited Vietnam last year. Your pictures are lovely as always – especially the views from ti top which are breathtaking. 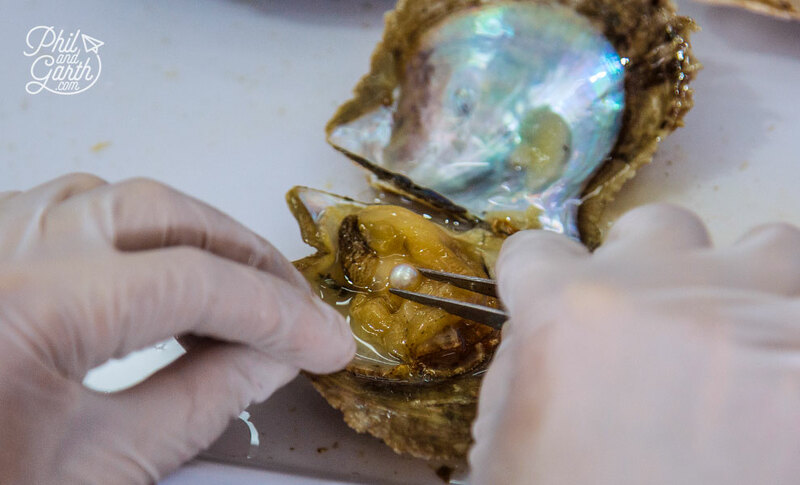 The pearl farm seems so interesting, I had no clue how pearls are made. Great post guys! 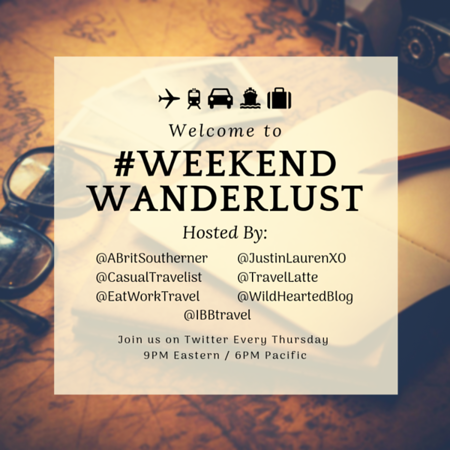 What a wonderful mix of things to do and see! Amazing place. I do wish to get there some day!